Damaged and ill-fitting dentures can cause problems with function and comfort and may cause bone and tissue changes. Dr. Kaplan’s State of the art in-office dental laboratory truly sets him apart allowing him to make denture and partial denture repairs, adjustments and relines to the very highest standards. Dr. Kaplan can usually do all repairs and relines professionally, quickly, and conveniently the very same day. As always, you can trust that the restorations are functionally correct and esthetically pleasing at Morristown Prosthodontics and Implant Dentistry. Replace or repair chipped, loose or missing teeth – If you break a tooth or several of the teeth in your denture, you’ll need to have them replaced. 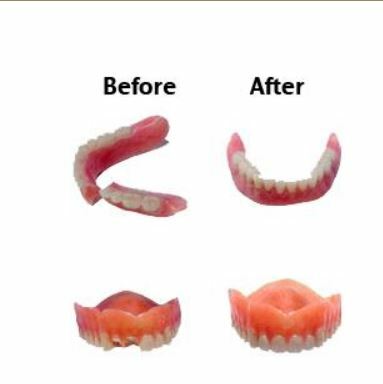 We can easily repair or replace teeth on your dentures so you can once again be proud of your smile. Add teeth to existing partial dentures -A partial denture is designed to replace various teeth throughout the mouth when other teeth remain. If you already have a partial denture and lose another tooth, we can add a new replacement tooth to your partial denture to better suit your current needs. Refitting your loose dentures (Reline) – Changes in your bone and gum tissues can create spaces that prevent your dentures from staying in place. The fit of the denture will loosen and thus be more prone to movement inside your mouth. Simply gaining or losing weight can have an effect on the shape of your gums. Combine all this with the normal wear on your denture from eating with them and cleaning them every day and you soon realize that all dentures will require refitting. Having the denture professionally relined will keep the denture secure and functional. A reline reshapes the underside of a denture to make it fit better against your gums. This helps to tighten the denture if any loose areas are present. Relines can be “soft” or “hard,” and can be completed at our on-site denture lab, usually the same day. By relining your denture, we are able to repair your prosthesis without having to replace it, giving your denture several more years of life. Repair Cracked or fractured Denture bases- Whether you’ve noticed a hairline crack or your denture has shattered into two or more pieces, we can help. Adjustments – If you get a sore spot (due to your denture rubbing against your gums or mouth tissues), Dr. Kaplan can make adjustments to relieve your discomfort. If you have any questions about denture repair or need yours fixed, contact Morristown Prosthodontics and Implant Dentistry today at (973) 540-1311 and schedule an appointment with Dr. Kaplan.